With a matchbox car or toy train in hand, kids’ imaginations know no limits. Now there’s a road that can go wherever your child wants to place it—on hardwood floors, carpets, tabletops, couches, and even up the walls. Made in the USA, PlayTape is the brainchild of Dad and founder Andy Musliner. Inspired by his son’s obsession with things that go vroom, Andy noted that what was missing from his little guy’s collection of cars, trucks, and trains was an easy way to lay down tracks. Available in several widths to accommodate vehicles of varying sizes and shapes, PlayTape is a roll of easy-tear tape that looks like a blacktop or railroad and sticks to any flat surface without leaving behind sticky residue. Like painter’s tape, PlayTape is non-damaging and can be repositioned however your child desires. For playing (and even decorating) at home or traveling on vacation, the possibilities are as endless as a desert highway. Hi Grommet fans. I’m Andy Musliner, creator of PlayTape. 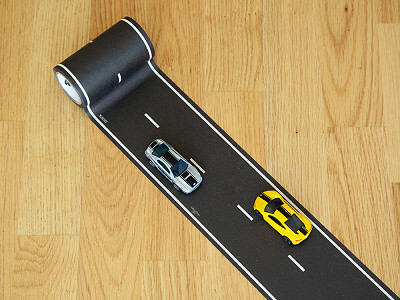 Invented for everyone with toy cars or trains, PlayTape is the super fast way to create the roads and rails you need for imaginative play - anytime, anywhere. Just unroll, stick, and play! Plus, it peels right off, without leaving residue behind. 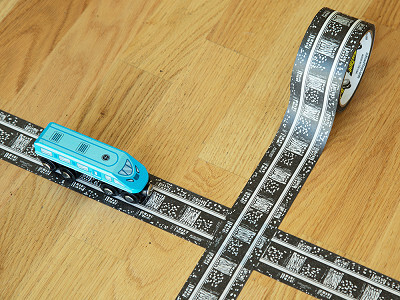 PlayTape enables you to take the toy roads or rails you imagine in your head and make them a reality. Instantly. I’m excited to have the opportunity to introduce you to a whole new way to play with toy vehicles. Ready to get on the road? If you have any questions before you roll, feel free to ask. @ericka Ericka - Thanks! Glad u like it! LOVE, LOVE This! Didn't even know this existed..Perfect for little kids and big kids! @Kathy Thanks, Kathy! PlayTape is in fact new this year. Many thanks to The Grommet for helping us get the word out. And I like your observation about PlayTape being a good "toy" for big kids too. As an example, we've found that collectors and hobbyists appreciate the ability to instantly lay down roads and train tracks for displays. @Catherine Hi Catherine. Excellent question. PlayTape is repositionable. That is, you can stick it down, peel it up, and re-stick PlayTape 3-4 times before it starts losing its adhesive properties. It's easy to reposition and even unwrinkle small mistakes so you can get it just right. This prevents the frustration factor that often accompanies tape. I want to be careful not to imply you can roll it back on the roll and reuse it again another day. Like any tape, PlayTape is a disposable, consumable product. And, because it's made of paper, it's recyclable. Awesome idea...Too bad our house is carpeted!! @Craig Craig, The description it says it sticks to carpets, couches, etc. @Beth Geezzz...What I get for not reading everything! Probably gonna have to try this out - my son will LOVE it! @Craig Hi Craig. PlayTape will work just fine on many different carpets. The lower the pile, the better, and the cleaner the carpet the better (of course). I don't recommend trying it on the 70's shag that's in my parents' attic, but commercial carpets, berbers, and even the plush dense medium-pile carpet in my livingroom work fine. From a technical perspective, the more surface area there is for PlayTape to adhere to/with, the better it will work. 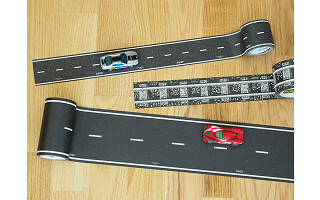 For example, the 4" wide PlayTape (which is designed to-scale for 1:64 cars like Hot Wheels and Matchbox) has enough sticky surface area to work on most carpets. I've even had it stuck down in the carpeted hallway of a tradeshow (awful quality carpet) with hundreds of people walking on it and it survived that beating surprisingly well. For a visual example, there is a video on our website home page (www.InRoadToys.com) that shows PlayTape being used extensively on carpet. Hope that helps. How long is each roll? Correction (per below where Dana caught my error): Roads - 2"x60' and 4"x30' roads. Apologies. Andy - it would be helpful if the road tape ordering page specified what size car each size road tape is intended for. I saw your comment below that the 4" tape is perfect for matchbox cars, but then what would the 2" size tape be for? I had actually assumed the 2" tape was for matchbox cars until I saw your comment below. I have a 5 year-old son with multiple size cars and trucks so it would be helpful to know this information. Thanks! @Laura Laura, you have a super question. It will take me a few minutes to write a thorough response. Stand by… I'll send this out in pieces. Let me start with trains, because that's easiest. We currently make one size train track, it's 2" wide and the rails on the tape are designed to be EXACTLY to-scale compatible with all of the most common wooden (and some non-wooden) trains, including Thomas the Tank Engine, BRIO, Melissa and Doug, Ikea, Big Jigs, and some of the Lego trains. When I say PlayTape is compatible what I mean is you can drive a train right off a wooden train track onto the floor (table, desk, counter, whatever) that has PlayTape on it and the rails on PlayTape will line up exactly with the rails on the wooden track and with the wheels on the train. PlayTape's Classic Rail Series is targeted to be compatible with the common wooden trains in particular, all of which are the same scale. Metal and model trains are a different story. They have many different scales. @Andy On the sizes, I think you mean 4" x 30' and 2" by 60'. Now, onto roads. For those who don't want to read my missive that will follow, the answer is: It depends, and in the beginning it probably doesn't matter too much. Go for whatever size you think will appeal to your child. The longer answer follows. Which road PlayTape is best for you or your child can be dependent upon age, level of obsession (with cars), purpose, and surface you expect to use PlayTape on. Age: PlayTape is made to-scale. However, the concept of to-scale is something that children grow into. Younger children, typically ages 3-6 or 7, don't know or care about scale. All they care about is that there is a road for their cars. They will gleefully drive any size car on any size road (that's why we don't give them driver's licenses at that age). As long as they recognize it as a road, they're happy. For this reason, I typically recommend the 2" wide road for younger children, regardless of the size of the cars or trucks they have. The 2" wide roll is easier for young children to handle (it has less surface area and comes off the roll easily) and they are typically less concerned about (or oblivious to) scale. Of course, in child development, there are no absolutes. Every child develops at a different pace and with different interests, so this is just a guideline. Back to roads… Level of obsession (with cars): I loved loved loved cars as a kid (couldn't you guess?). My sons did too. The more obsessed they are about cars, the more likely they are to have automotive facts in their head and care about accuracy and things like scale. 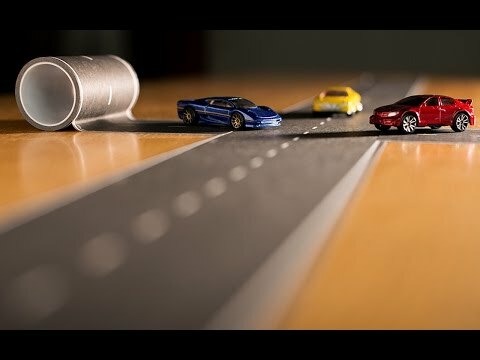 For the older child (6/7+) and for the slightly younger child who has advanced interest in cars, I would recommend the 4"x30' roll for compatibility with the most common cars they probably have on hand - 1:64 scale, which includes Hot Wheels, Matchbox, and others of that size. 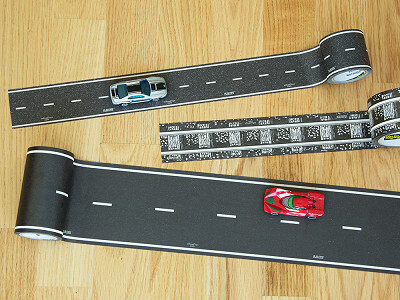 With the 4" PlayTape, a 1:64 scale car will fit properly in a single lane as they would on a real highway. Purpose: I already mentioned that 1:64 scale PlayTape is compatible with popular toy cars like Mattel Hot Wheels and Matchbox and a good fit for Skullduggery, as well as some Tonka, Lego, Maisto, Greenlight, Auto World, Jada, Disney (made by Mattel), etc. The 2" wide PlayTape is 1:128 scale and, if you care about scale, is a very nice fit for smaller cars like Nitro Micro's (from Kid Galaxy) or the 1:87 scale cars from various manufacturers. Train hobbyists have found both size roads *almost* the right scale for creating roads for certain types of train displays. In many cases, *almost* has been good enough because PlayTape is so much easier than painting a road :). PlayTape makes a good travel toy. Just take a roll of PlayTape and a car or two and BAM! instant town wherever you are - at the airport, at the restaurant, at grandma's, at book club :). Which size you choose is less important here. Surface: PlayTape will stick to pretty much any flat surface, and I've covered the topic of carpet pretty thoroughly above. If all you have is carpet, I recommend the 4" wide PlayTape for the most sticky surface area, though as I mentioned earlier, the 2" wide will work in many cases. If you have laminate, tile, hardwood, walls, glass, vinyl, stainless steel, or just about any other flat surface, any size PlayTape will work. And finally on this topic, what we've found is that children appreciate the creative outlet that PlayTape offers, regardless of the width of the roll of PlayTape. It's the road they had in their head all this time but never had a way to express it in real life. Laura, thank you for the excellent question. For your 5-year old, I recommend if you have to pick one to start with go for the 2" wide roll. Thanks for your patience with my long answer. Hey Andy.. I am a LEGO freak. How do you suppose the 4" tape would work in building a LEGO city? The roads LEGO makes for their sets are excessively expensive. @Theresa Theresa, another great question. 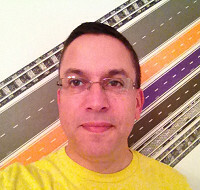 In general, PlayTape will work quite well as roads for a Lego city. Certainly, it will do what you want to inexpensively connect all the Lego buildings and cities to one another in a cohesive setting. The trick with Lego is that they make a variety of different scale vehicles, and I'm sure you have a large Lego collection, so I don't want to guarantee that the 4" PlayTape fits exactly right for all Lego vehicles. Especially ones that are fantastical. If you figure you have just under 2" per lane, that's the scale you're working with. To be more specific, I have (but can't seem to lay my hands on them at the moment) a few small Lego construction vehicles (can't remember the Lego series) that I just bought a few weeks ago and they fit perfectly on the 4" PlayTape. And I have a Lego Creator train (which I did find) #31015 which fits perfectly to-scale on the PlayTape train track. So there are definitely Lego vehicles that align in scale nicely with PlayTape. P.S. I still have my Legos from when I was a kid. Yup, fan. @Andy Thanks Andy. You've sold me. When I was a kid, all we had for "roads" were the designs in my grandmother's oriental rug. I loved to visit my grandmother with a stash of cars in a paper bag. It was my poor mother who had to sit for hours with her mother in law so that I could play. That's probably why my mother eventually scrapped together the money for an oriental rug. Clearly PlayTape would have been a much more cost effective solution for my mother. Does the adhesive on this tape damage any of the surfaces listed when it's removed? Does it leave a residue? @Shelley Shelley, with the ultimate question every parent cares to know. In two words, no, and no. (that is no, it won't damage any surface and no it won't leave any residue). PlayTape is both kid and mom-friendly. Lots of details below. PlayTape is also unexpectedly durable. You can create an entire cityscape on the floor in a high traffic area like the kitchen, walk all over it for a week or more - even vacuum over it - and still peel it up without leaving any residue behind or damaging the surface underneath. We've done a few fun tests: Stuck it to vinyl siding outdoors and let it stay there for weeks in rain and snow. Result: Surprisingly stayed on; chilly peeling off and a little more difficult to do so, but still relatively easy going. Created Lower Manhattan out of PlayTape on the kitchen floor and let it stay there for three weeks under normal kitchen use by a family of 5 (you can see this scene in the video above). Result: The city stayed there largely unharmed until we peeled it up … which took about 2 minutes. I have even heard of customers who mop over PlayTape, though I don't recommend this. It is paper, after all, and will succumb to water. 1) PlayTape is tape. It's low-tack, but it is sticky. If you stick PlayTape to a surface where the finish is already coming off or is loosely adhered, PlayTape (or, frankly, anything that's sticky) has the possibility of damaging the surface. The probability increases the longer you leave it stuck. Common sense. 2) If you leave PlayTape stuck on something for a long, long time - as in months - it can become more sticky over time. This has both positives and negatives. Good if you're permanently decorating your computer with PlayTape - as I did. Your design should stay there. On the other hand, more work if you plan on changing the design once every six months. Long-term PlayTaping requires a little care and forethought. In summary, kids love tape (or anything sticky). In normal, everyday use PlayTape is harmless to the surfaces you stick it to. Kids can stick it down just about anywhere and peel it up later, and moms don't have to worry about having a damaged house or tripping over their child's imaginative creation. Instead, moms get to put their feet up, have a cup of tea, and smile. I hope you enjoy the new creative fun of PlayTape. Thank you all for allowing me to join in the conversation on launch day! Will there be a new supply before Christmas since it is out of stock? @Jo Jo, yes, there should be ample supply. This is a very temporary situation - a result of a good first day on The Grommet (thanks, all!). More available shortly. With a matchbox car or toy train in hand, kids’ imaginations know no limits. 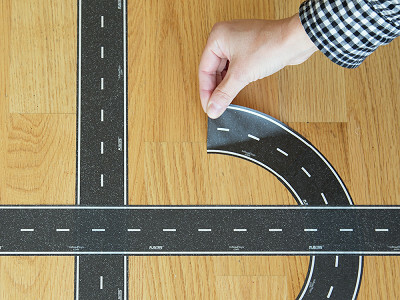 Now there’s a road that can go wherever your child wants to place it—on hardwood floors, carpets, tabletops, couches, and even up the walls. Made in the USA, PlayTape is the brainchild of Dad and founder Andy Musliner. Inspired by his son’s obsession with things that go vroom, Andy noted that what was missing from his little guy’s collection of cars, trucks, and trains was an easy way to lay down tracks. Available in several widths to accommodate vehicles of varying sizes and shapes, PlayTape is a roll of easy-tear tape that looks like a blacktop or railroad and sticks to any flat surface without leaving behind sticky residue. Like painter’s tape, PlayTape is non-damaging and can be repositioned however your child desires.